Our lab aims to study human embryo implantation and provide solutions to improve in vitro fertilization (IVF). 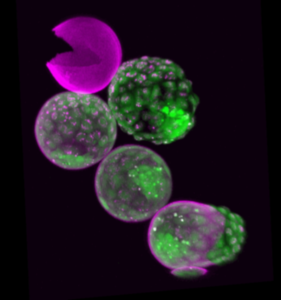 3D Transgenic embryo expressing fluorescent Oct4 fused to GFP. The blastocysts breaks out of the protective shield called zona pellucida (purple), in an event termed hatching. The embryonic development of humans (and mammals in general) requires the implantation of the embryo into the walls of the mother uterus. Implantation involves the attachment of the embryo to the uterine lining, termed endometrium, and the invasion of the tissue to form the placenta. This process is crucial for natural conception and especially for in vitro fertilization (IVF) as only 25% of IVF embryos successfully implant into the mother uterus’ and develop to term. However, despite the central role of implantation in human fertility, the process is still elusive to experimentation because of its inaccessibility. In our lab we use bioengineering methods to create 3D environments that support embryonic development outside of the mother uterus. Our systems are accessible to imaging tools which allow us to interrogate the genetics, metabolomics and mechanics of the embryo in a high throughput manner. Using our systems we are capable to (i) improve embryo culture conditions and (ii) diagnose embryos with improved implantation potential. 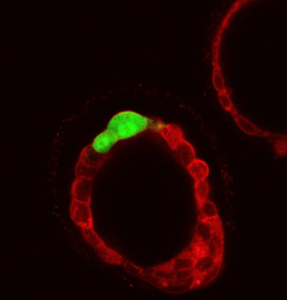 Transgenic mouse embryo at blastocyst stage expressing the fluorescent protein tdTomato in the membrane and pa GFP in few selected cells. Due to the high translational component of our research, we have established collaboration contracts with the pharma industry, hospitals and venture capital to bring our technology to the clinics and the market. Our Open Lab is a multidisciplinary environment where biologists, biophysicists, clinicians and business developers synergize to create a unique environment shaped by science and entrepreneurship.